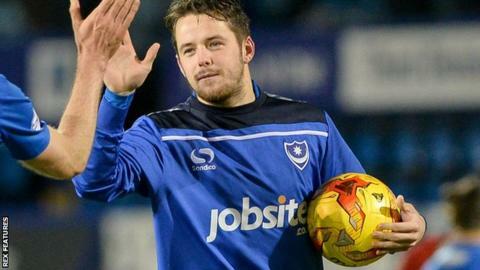 Portsmouth hat-trick hero Marc McNulty was quick to credit his fellow frontman despite his three goals helping Pompey to their biggest win of the season. Striker McNulty, on loan from Sheffield United, netted the first Fratton Park hat-trick by a Portsmouth player in 18 months as York were thumped 6-0. The 23-year-old Scot praised the work of strike partner Caolan Lavery. "Building up a partnership with Caolan will hopefully see us go a long way this season," he told BBC Radio Solent. McNulty and Lavery are both on loan at the League Two club, Lavery from Sheffield Wednesday. The pair have netted five goals between them in Portsmouth's last two league games. "Hopefully I can pay Caolan back down the line," added McNulty. "I'll obviously get the plaudits for scoring the goals tonight, but he was fantastic in his running and service." Portsmouth assistant manager Leam Richardson was equally delighted with the impact of the loanees. "They're the type of calibre of players myself and Paul Cook have worked with before and tried hard to get here," he said. "Hopefully other players will come on leaps and bounds as a result of their impact."